Precise launch is the difficult one among all launch projects. Precise control is always a trial of the launch technology and equipments. 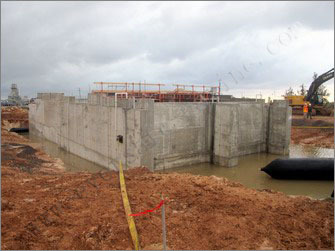 On April 5th Eversafe marine team successfully launched the 1400 tonnes Pumphouse into a 34 meters hole on Sherritt Boca de Jaruco gas power plant. 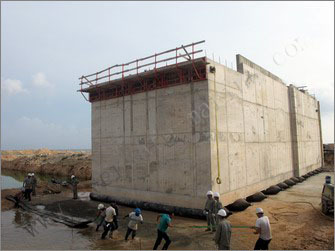 That concrete structure measured by 28 m long, 10 m wide and 8 m high is designed for water cooler Pumphouse. 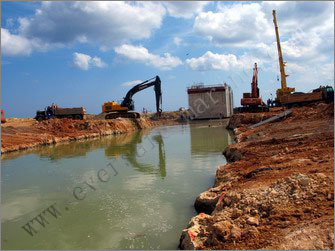 The Boca de Jaruco facility is located 50 kilometers east of Havana Cuba. Sherritt holds an indirect one-third interest in Energas, a joint venture established to generate electricity for sale to the Cuban national electrical grid. It has 163 MW capacity and is reportedly Cuba’s cleanest and most reliable power generator. Eversafe Marine undertook this project under the all inclusive contract that include providing all equipments and operation on site. 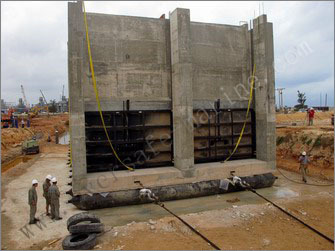 By cooperating with Canadian Allnorth company, Eversafe provided all required design for the project from construction sleepers, launch ramp to launch arrangement. That Pumphouse was built upon 35 cm high concrete sleepers with 3 m space apart on flat ground. 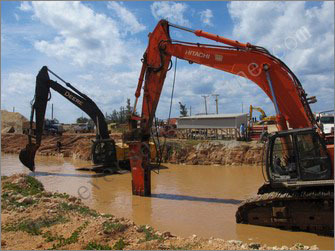 The hole dug to hold and float the structure is 6 meters longer, 4 meters wider than structure specification. Distance from structure to the hole is about 30 meters. Due to limited hole dimension, the structure launch must be precisely controlled that is most concerned by client. To restrict structure’s movement all along the launch is infrequent. The moment of moving structure is quite big due to its huge mass, generally people will limit its movement only after structure floats. Eversafe team made the most safe rigging design in which safety factor reached 5 times. Every airbag’s position was calculated carefully to ensure the launch safety. The launch ramp preparation work is a hard job especially for underwater part. Thanks Sherritt and Energas site crews for their arduously work. Eversafe team arrived in Cuba on 25th March. After tasted Cigar and rum , not for Chinese in fact, we started to install winch and reeving. 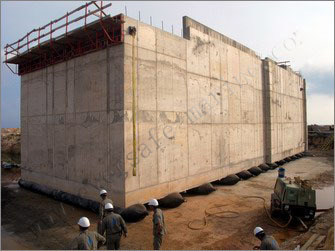 On April 1st all airbags were positioned and structure was lifted from concrete sleepers. The ramp preparation work took two more days than plan then on April 5th the launch begun. That day the bad weather was really annoying, it rained five times. People had to put on and took off raincoat again and again, it is muddy everywhere. 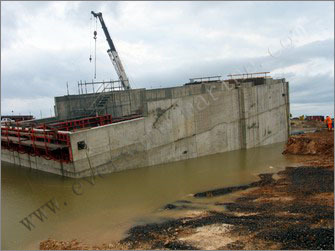 Eversafe crew withstood the cold and rain, moved structure forward for 25 meters in the morning low tide time. At PM five o’clock when the water level rose up we started the final launch. 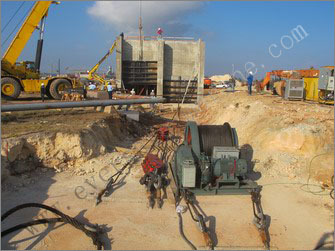 By the wire rope releasing structure moved forward slowly and steadily at last it floated at the right position. The whole launch took about 10 minutes. It is the first time to see airbags launching in Cuba. Also Energas power plant is famous across the country.. At the launching day, lots of people came to witness the fantastic launch. Cuban national TV station made an documentary for the project and interviewed Eversafe engineer also. At last we should give our sincere thanks to Sherritt /Energas crew. Without their support we can not complete the job successfully.